Since having children, red has made its way into my life. I literally NEVER used the color in any decorating whatsoever but it felt like 100% the right choice for the kids' spaces. Ana Claire's nursery got a heavy dose of red with bedskirts, a light fixture, side table, and curtain trim. And Mac's nursery's primary color is shaping up to be red. And I love it. 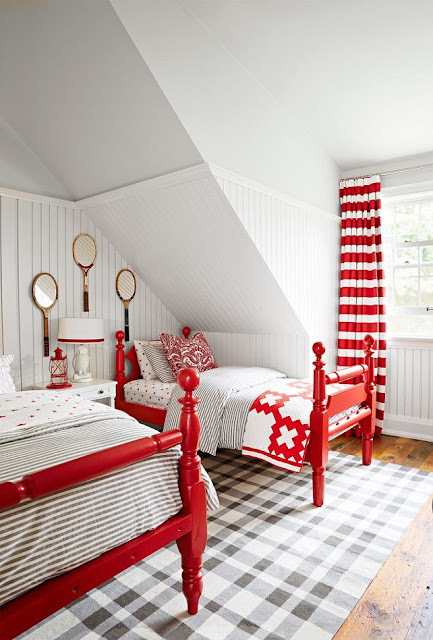 And I love this room above with it's tailored color palette of red, white and gray. Those twin beds and quilts are bananas. And I love the juxtaposition of the strong color against bright, white walls. It's all so simple but striking. May your Wednesday be simple and striking as well. Happy hump day! Daniela I love this bright, light and cheering room!! --this is Janel, but apparently I am posting as unknown. I am stealth.